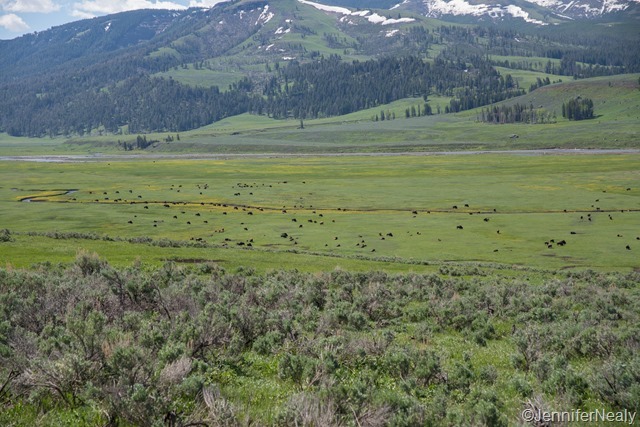 While we were in Yellowstone, we kept hearing that the Lamar Valley was one of the best places for wildlife sightings, so we planned to spend a day exploring it. 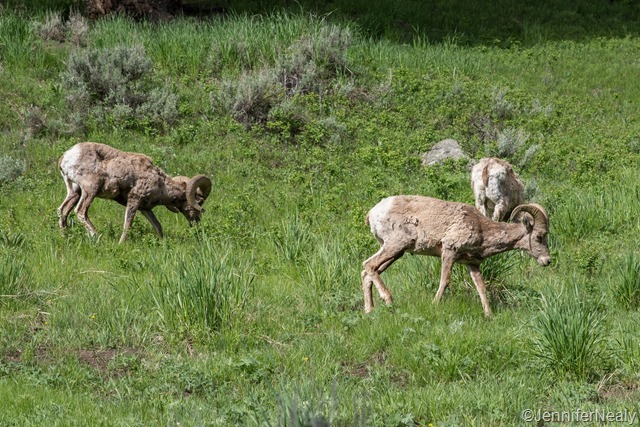 We had barely gotten a mile down the road when we saw some big horn sheep. We pulled over and I got a couple of quick pics. 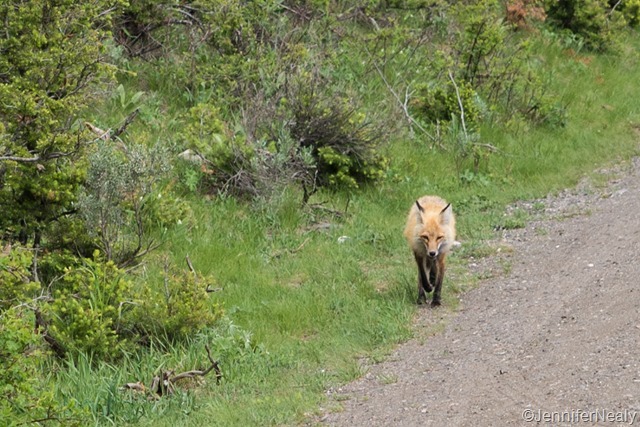 As we started walking back to the car, a cute little fox appeared just trotting down the road! A few more miles down the road we started to see all of the bison. There are huge nursery herds here – lots of moms with babies. There were hundreds of them! The picture below is just one small section of them. We followed the road through Lamar Valley all the way to the northeast entrance of the park. 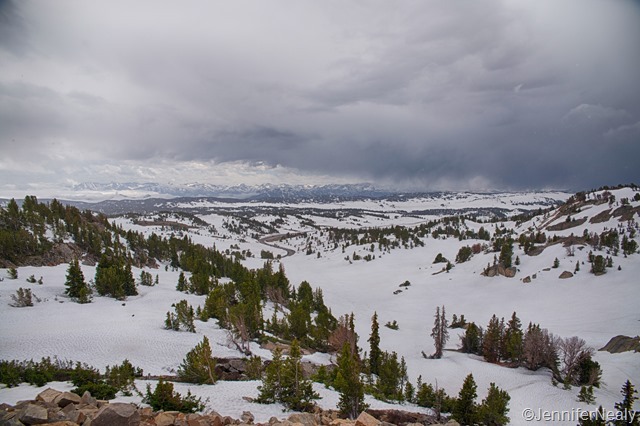 Since we came that far, we decided to explore the Beartooth Highway. Almost immediately, we drove into a winter wonderland. We followed the road for several miles, eventually reaching 11,000 feet. At that point we found ourselves in a snow storm, and decided that would be a good time to turn around! This drive was so beautiful with all the snow – I would imagine when all the snow melts and the lakes unfreeze it’s even more beautiful. 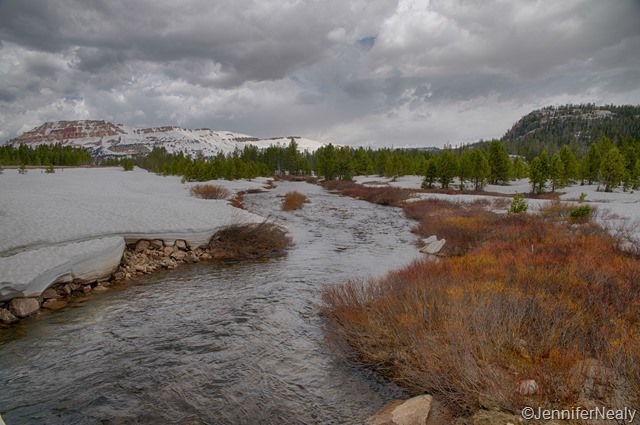 We drove back into the park through Lamar Valley again, and then headed back towards Fishing Bridge. Just south of the Canyon area is picnic area right on the Yellowstone River. We had stopped there and had lunch with Don & Gail several days prior. As we started driving past this picnic area, Deas and I both noticed something strange in the river – a herd of bison was in the river swimming across it! 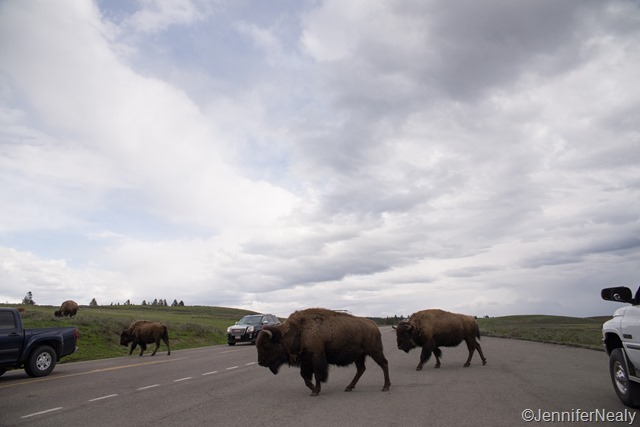 At the same time, we also saw all the people in the picnic area quickly grabbing their food and their children and running towards their cars – the bison were seemingly headed right for them. We quickly parked and I grabbed my camera. The bison made it to the other shore, and then as they climbed out they just kept running down the road! We just couldn’t believe what we had seen! There are bison everywhere in Yellowstone, and we were almost getting tired of seeing them, but seeing them swim across a river was just amazing! I’d love to know what they were running from. We thought that would probably be our most interesting bison experience, but they had one more treat in store for us. 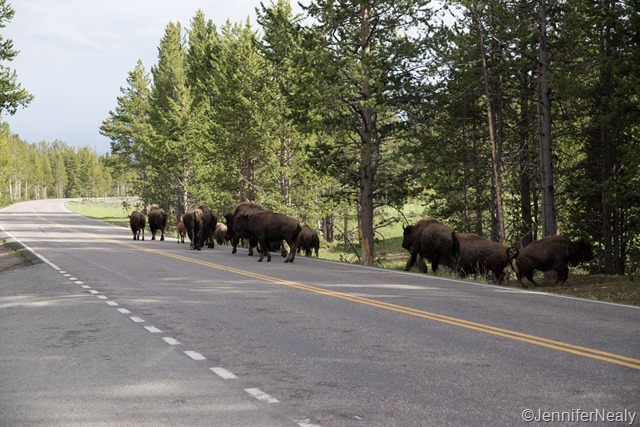 As we were crossing back through Hayden Valley (another great wildlife spot), we drove upon another huge herd of them – but they were all over the road, stopping traffic. 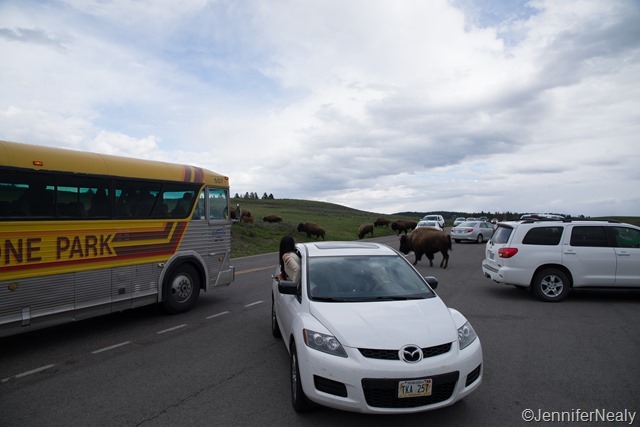 Rather than try to fight our way through the cars and bison, I chose to just pull into an open spot in one of the pullouts. But as soon as I pulled in, this is what we were looking at. Is it just me or does he look a little annoyed? I quickly cut off my car engine, and just as quickly began to second guess my decision to pull over. We were pretty much surrounded by bison at this point, and were anxiously trying to stop the dogs from barking. 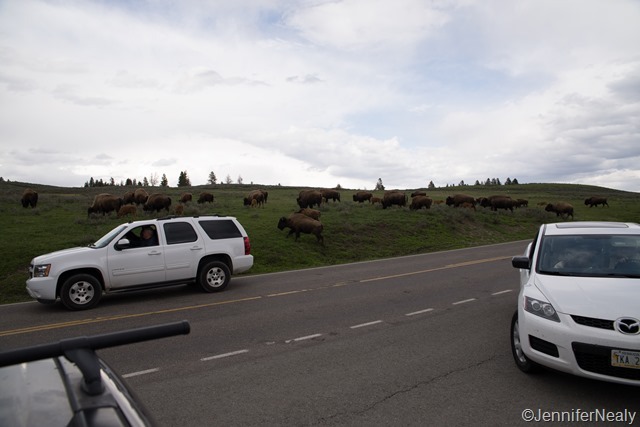 Other than the one bison above, most of them seem pretty uninterested in all the cars and all the cameras that were being aimed at them. There were a few babies in the group, and as with all baby animals, they were simply adorable. Although I’m pretty sure the one below was sticking his tongue out at us. Eventually they all started slowly making their way across the road. We kept on a eye on the big guy that was right in front of us as he calmly walked right past our car. I know that bison can move really fast when they want to, but if they’re not in a hurry, they take their sweet time. I think he was big as our CRV! Oh, wow! What an experience! You saw something I imagine few people see AND you got great pictures of it. 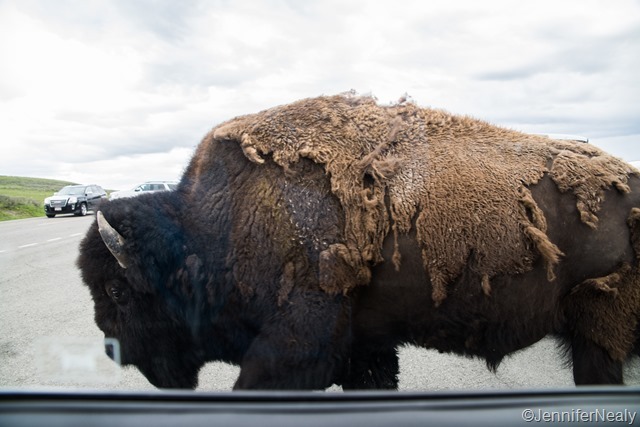 I know the feeling of being surrounded by bison with dogs that want to bark at the “big dogs” outside the car. Lizzie would listen, but Jack…well, Jack was Jack as a two year old lab. I remember our first trip to Yellowstone and we were anxious to see elk and bison. After a while, Rich was tapping his fingers on the steering wheel wishing they’d move. 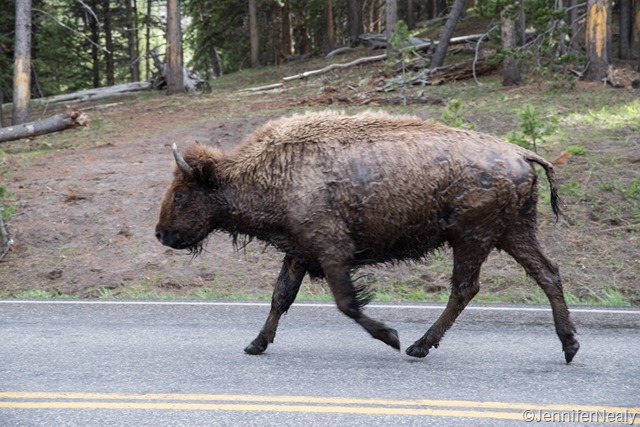 I also remember taking Lizzie out, trying to avoid stepping in elk droppings (nearly impossible up by the springs), carrying a bag to pick up her waste. We laughed about that. Seemed so silly, but of course we always cleaned up after her. It really was one of my favorite sightings, just because it seemed so unusual. The dogs wanted to bark so badly – but when the big one walked right by the car they were pretty quiet – I think they were a little intimidated by his size also! We have such amazing memories of our two years in Yellowstone. You could probably pick any month of the year and it will be snowing somewhere in the park. 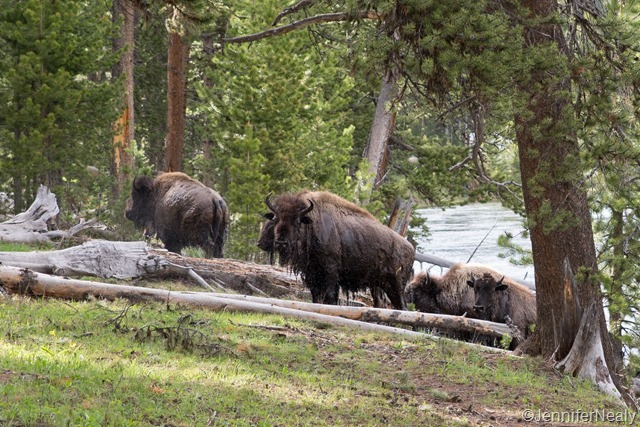 We had many experiences being surrounded by bison and watching them jump across Slough Creek but I have never seen them swimming across the Yellowstone River. You have captured some great moments! 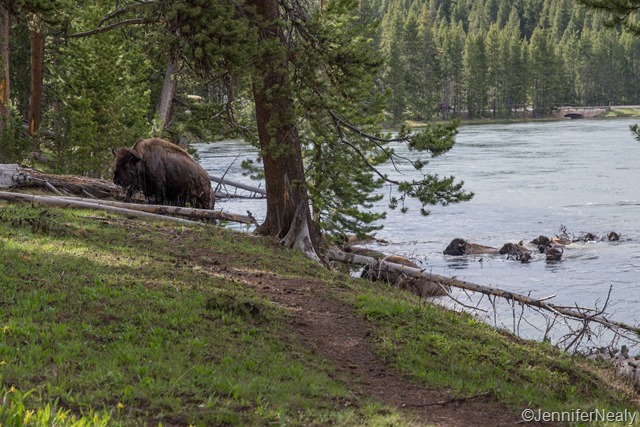 Did you blog during your time in Yellowstone? I looked on your blog but only found a couple of references to your time there. I can only imagine the stories you must have! Simply stunning. So ridiculously jealous. What a wonderful experience y’all had, thank you for sharing with us! I thought you might enjoy reading about it – glad you did! It really was pretty cool. 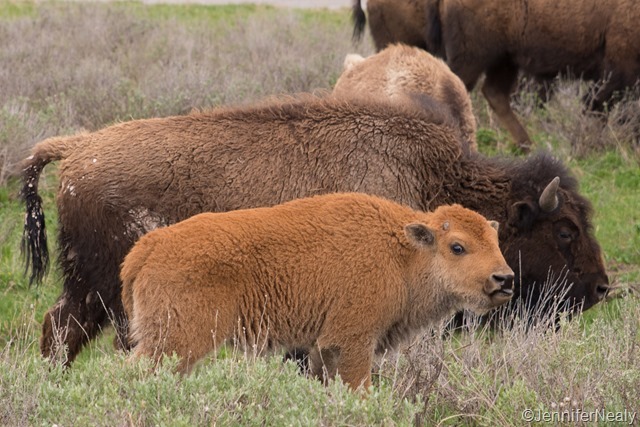 If you make it to Yellowstone yourself, you’ll definitely get your bison fix – they’re everywhere! I’m really hoping we don’t have any more snow days this trip. But we do keep heading further and further north….will have to keep a close eye on the weather! The Beartooth Pass is one of our favorite roads on a motorcycle. There will be snow most of the year. We have done the road so many times. It never gets old. 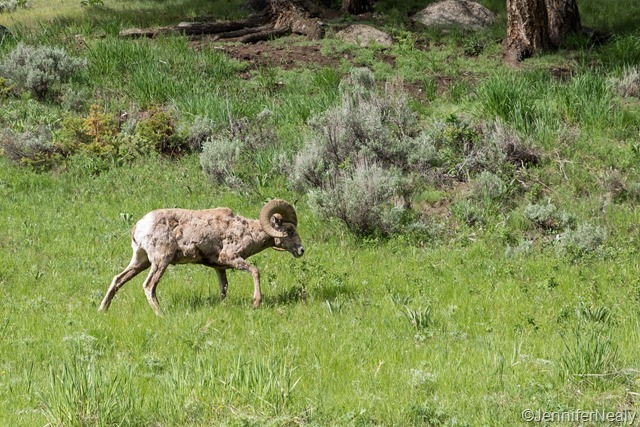 You had great wildlife sightings while in Yellowstone. I must have a thousand buffalo photos. I never get tired of them. You can imagine John’s nervousness when we are the motorcycle with the buffalo. Our last visit had us waiting over three hours as a herd of buffalo traveled 10 miles through a canyon to a new location. Since there was water on one side and a cliff on the other, they took the road. Thankfully, the park had a pooper scooper following them. The rangers estimated there about 150 in the group. 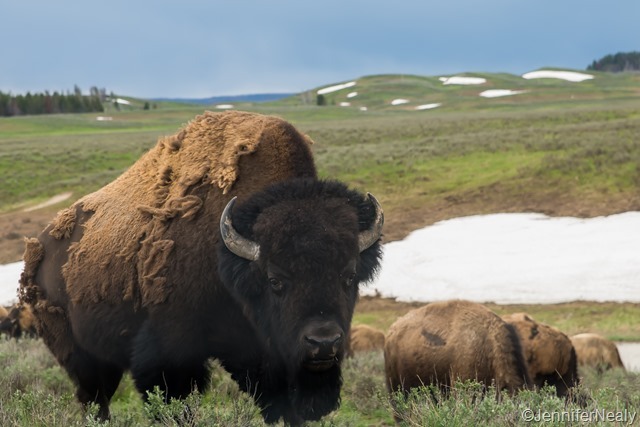 When we saw that large group of bison on the road, I did see one guy on a motorcycle – and he was definitely keeping his distance! A three hour delay sounds a little frustrating but kind of hilarious! They definitely know the art of moving at a leisurely pace. 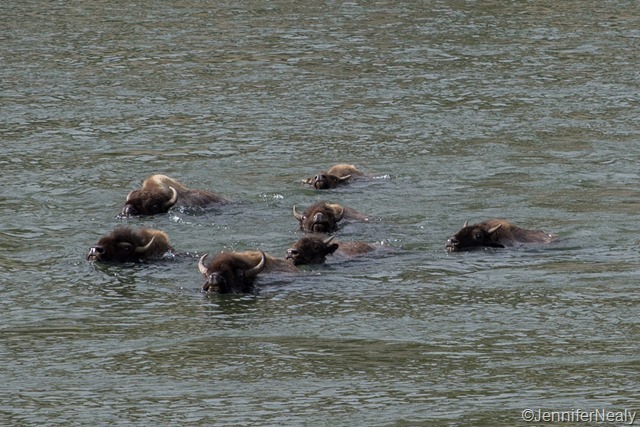 What a treat to see the bison swimming. 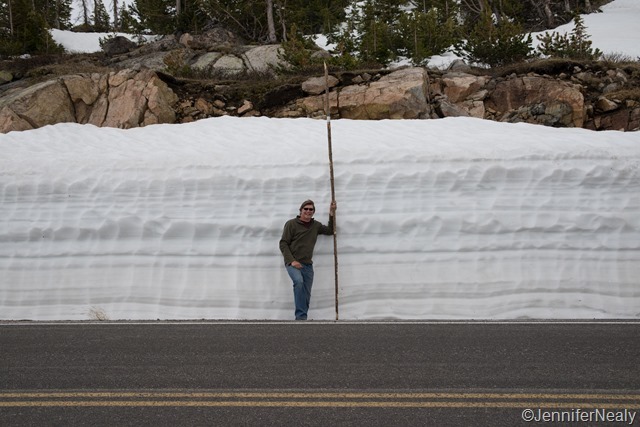 I’m so far behind on blog reading, but really enjoying catching up with your Yellowstone adventures! Such a cool experience! I can’t wait to visit Yellowstone in May! Seeing the bison swim seems so amazing! 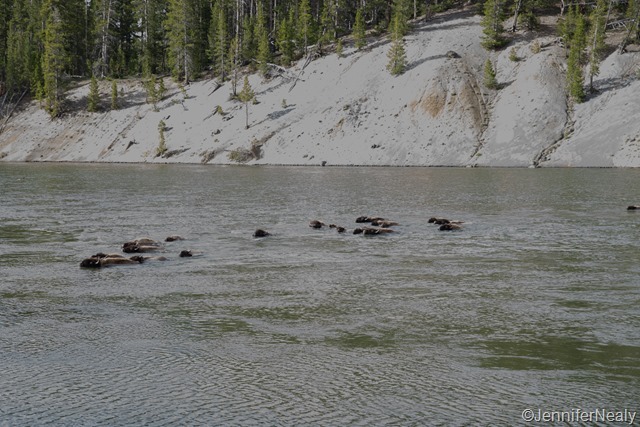 Previous Previous post: Yellowstone – Geysers, Tours, and Bears!